THE BOURNE LEGACY is very much the B-team continuing a critically acclaimed and commercially successful action franchise. Instead of director Paul Greengrass and star Matt Damon, we have Tony and Dan Gilroy and director and writer, and star Jeremy Renner (THE HURT LOCKER). The only sensible move the writers make is to avoid Renner just inhabiting the character of Bourne. Rather he is another member of the elite programme that created Bourne, who is still at large. The US intelligence service, scared that the programme of genetic enhancement will go public, decides to shut it out, which basically involves a manhunt of all the "mutants" and the scientists who did the work. Cue a partnership between Renner's agent and Rachel Weisz' scientist as they travel the world looking for the drug that will "lock in" Renner's enhancements. THE BOURNE LEGACY is a good enough "tab A into slot B" movie with solid performances from the lead actors and a good enough script and plot premise. I remain sceptical about whether Renner is really a leading man - whether he has sufficient charisma and screen heft. I wanted more of the danger that lurked just below the surface in THE TOWN - more of the raw edginess. I also remain sceptical about Tony Gilroy as a director as opposed to a screenwriter: too many of the chase scenes felt baggy and boring. There's none of the subtlety, style and confidence that he displayed in MICHAEL CLAYTON. Overall this film is not as bad as many had feared, but it isn't really in the same league as the original trilogy. THE BOURNE LEGACY is currently on release in the Philippines, Singapore, the Czech Republic, Taiwan, Hong Kong, Canada, India, Paraguay, the USA, Vietnam, Ireland, the UK, Spain, Australia, Denmark and New Zealand. It opens on August 23rd in Argentina, Portugal, Serbia, Slovenia and Mexico; on August 29th in Indonesia, Sweden, Bahrain, Kuwait, Peru, Russia, Bulgaria, Ukraine, Colombia, El Salvador, Estonia, Latvia and Turkey. It opens on September 6th in Hungary, the Netherlands, Brazil, Italy, Lithuania, Norway and Pakistan; on September 12th in Belgium, Germany and Israel; on September 19th in France, Finland and South Africa; on September 28th in Japan; on October 4th in Greece; on October 25th in Chile and China and on November 23rd in Venezuela. 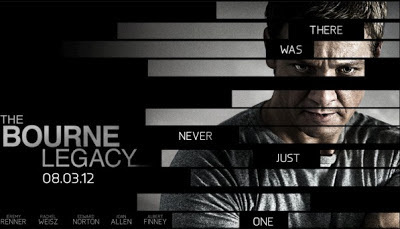 THE BOURNE LEGACY is rated PG 13 in the USA and has a running time of 135 minutes.